Spending her entire twenty-four years hiding in the background and perfecting her status of wallflower, Anna Zimmerman arrives at the astounding conclusion it’s time for a change. 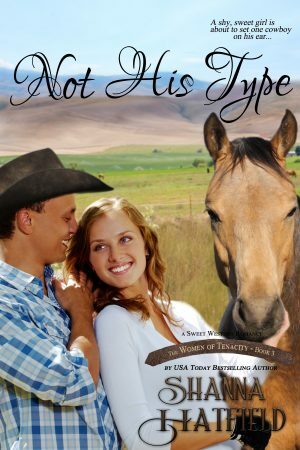 Tired of living life in the shadows, she steps into the light, unprepared to handle the attention of the charming, handsome cowboy who works across the street. Too good-looking for his own good, Jake Chandler is a tease who likes his women petite, blond and outgoing. When a chance encounter brings him nose to nose with the tall librarian across the street, he discovers his type of girl expanding to include statuesque brunettes. Jake has his work cut out for him as he strives to convince Anna to come out of her shell and give him a chance. Had her lips always been so rosy and ready to be kissed? Had she gotten taller? She seemed to be ten-feet tall today and absolutely, positively ravishing. He had no idea with the right clothes and hairstyle that Anna would morph from attractive into a drop-dead knockout. He escorted her back to the door, his hands shoved deep in his pockets to keep from touching her. Jake didn’t know what had come over him but he was beginning to fear it was something fatal. He couldn’t breathe, couldn’t think, his stomach hurt and his head was beginning to pound; the same thing that happened every time he found himself this close to Anna. “I don’t think so,” Anna said, starting to blush and beginning to feel her fears overwhelm her resolve to be more outgoing.